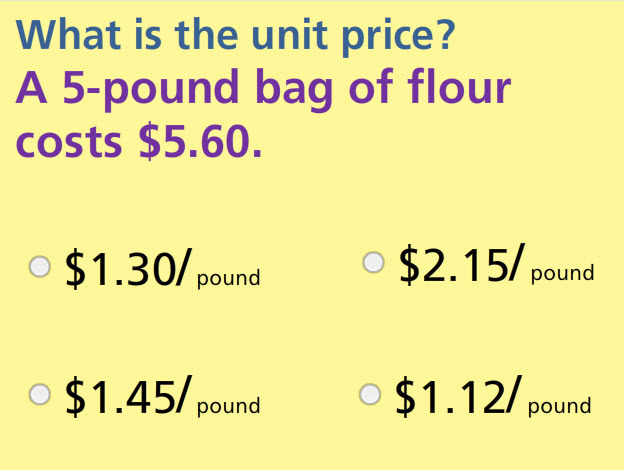 This test has ten multiple choice problems designed to give students several opportunities to calculate unit prices. Practical applications include problems that will challange children to determine which of two purchase prices is the better bargain. This test is aligned to the 7th Grade Common Core Standards, and is a great way to assess students' knowledge of calculating unit prices. It can be used as a classroom activity or as an end of unit test. Return from this Unit Prices Math Test to the Middle School Math Tests , 7th Grade Math Tests webpage, or to Math Tests.